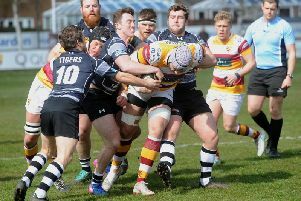 Warren Spragg acknowledged that Fylde RFC need to string some wins together to ease their relegation peril – though the head coach insists their situation has not worsened significantly since the turn of the year. Last Saturday’s 31-15 reverse at Rosslyn Park was their third straight defeat of 2018. Having also lost their last three of 2017, Fylde now find themselves nine points adrift at the foot of National One and 15 from safety. Spragg told The Gazette: “Yes, we’re frustrated, though I don’t think the overall situation has changed since Christmas. The top 10 teams are away from us and can’t be caught but the teams above us in the relegation fight have not pulled away. That turnaround won’t be easily achieved in the coming days, with tomorrow’s home clash aganst third-placed Ampthill followed by a visit to leaders Coventry. But Spragg saw plenty to encourage him in the performance in London, where Fylde scored two tries in a game for the first time since December 2. He added: “If you judge last Saturday as a stand-alone performance we were decent in most areas. “We made a few basic errors which they scored from but we were better tactically and the overall performance and team spirit were much better. Fylde traditionally struggle in the capital, though they twice pulled back to within a score only to concede tries at critical moments. They again conceded at the end of the first 40, increasing their half-time deficit from three points to 10.